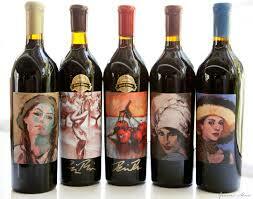 One of my favorite wineries in California is Artiste in Los Olivos on the Central Coast. Bion Rice the master blender (all Artiste wines are blends) of Artiste and winemaker and manager of Sunstone Wines, puts wax seals on all Artiste bottles. A number of wineries do this, mostly for aesthetic purposes. 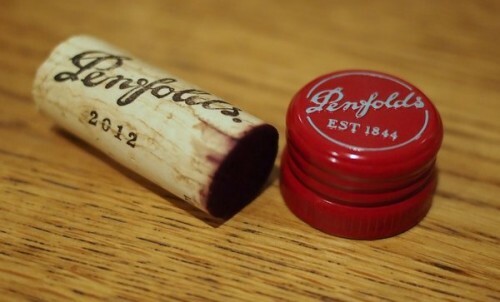 The wax seal can also serve to prove the the wine has not been tampered with. So how best to open a bottle with a wax seal? Many wine openers will not work with these seals because the wax gives the top too large a circumference for them to fit over the bottle top. So electric openers are out, as are some others. Many try to chip the wax off of the bottle with a sharp knife, the tip of their corkscrew or the little knife used to remove foil coverings from the bottle. These can work, but can lead to injury, to pieces of wax flying around the room, and to an unsatisfactory result. The best way to open these bottles is with a Waiter’s Friend or a winged corkscrew. Simply put the corkscrew through the middle of the wax top and into the cork. When it is properly seated, remove the cork as you normally would. The wax will come with it. Then, enjoy your wine! Opening Wax Top Bottle with Waiter’s Friend Opener. And here is a (LINK TO ARTICLE). The article goes into greater depth about each step in the process of getting wine to you via retailers. 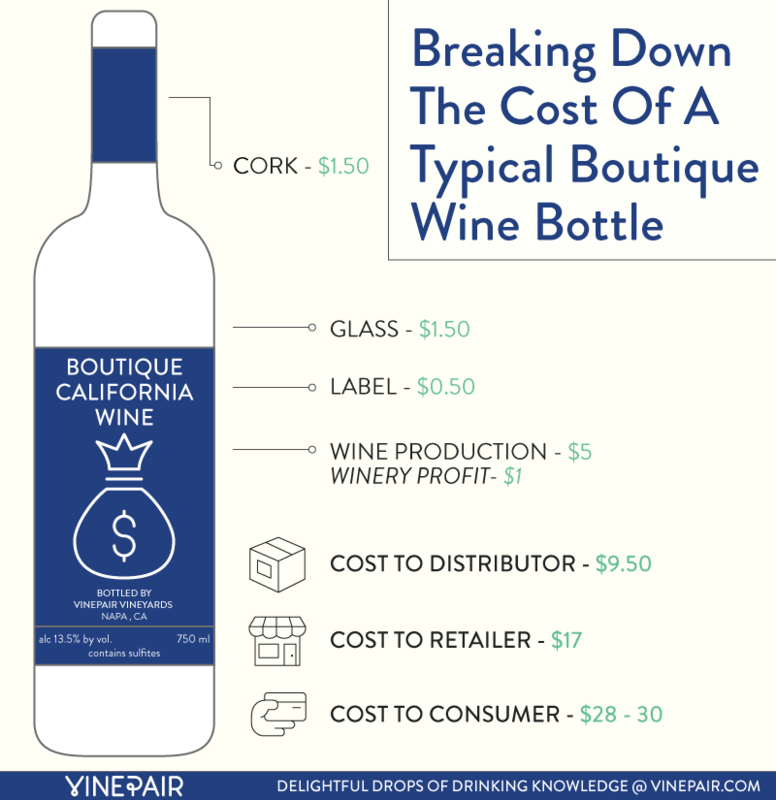 I find it very interesting that getting the wine to the consumer is by far the largest portion of the cost of wine. If you added in buying this wine at a restaurant, the cost to the consumer zooms to about $60 or more, as the “retail” portion would go up since restaurants typically mark up wines to twice the retail cost or more. This also makes it more satisfying to buy wines at the winery, so that the winery makes the additional money. It is also why wine club prices are discounted, since the distributor is not in that equation. It’s good to know where your money goes, so that you can make wise choices. There really aren’t any surprises here, except perhaps how little the wine maker gets from each bottle produced – but isn’t that the way that the economics of farming works? Here is another great article from VinePair.com on what to do when the waiter or sommelier give you the cork from that bottle of wine you ordered in a restaurant. This could save some anxiety and embarrassment. This article from the LA Times website, pointed out by our friends @AlmaSolWinery via Twitter, speaks to the issue of corkage fees – something that people often find confusing. A corkage fee is a fee that you pay at a restaurant when you bring your own wine. 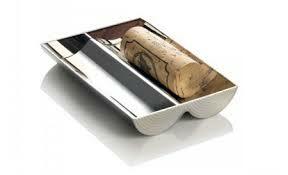 It normally includes glassware, opening and pouring the wine by the sommelier or server, and disposal of the bottle. Which Wine Opener to buy is always a big issue. Like most wine lovers, I have quite a few, not counting the half dozen or so now in the possession of the TSA. A while back, I was given the Cork Pops Legacy Wine Opener, a gas-operated little gem that includes a foil cutter in its excellent design. Priced around $25 to $30, this gadget makes opening wine a joy, even with tricky corks. This isn’t a corkscrew, as it has no screw – just a straight hollow needle that pierces the cork and puts gas between the cork and the wine to force the cork easily out of the bottle neck. It works like this. You can use the foil cutter (four sharp disks on the bottom of the legs) to remove the foil cap, then push the needle through the center of the cork. Once the device is fully seated on the bottle, you simply press the top with your thumb. This activates the gas canister and pushes gas into the bottle, easily removing most corks. The taste and aroma of the wine are unaffected. 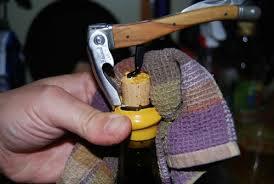 To remove the cork, you twist the opener where the legs join the body, and the cork slides back down the needle. 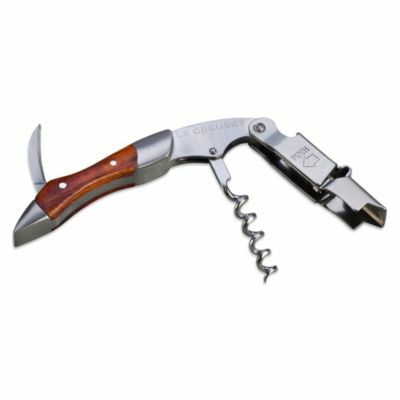 This has become my go-to wine opener at home, and I have given several as gifts. Now, let’s look at some drawbacks. 1. This device does not travel well. It comes in a clear plastic case, so taking it to a friend’s home or on a picnic will work. But you can’t take the opener with gas on an airplane, so you will still need a good travel opener if you are flying. 2. The Legacy does not work on large format bottles or with very long corks where the needle cannot get all the way through (a very small percentage of corks, fortunately). Nor will with work with bottles that have a wax cap over the cork – you might bend the needle trying to push it through the wax, and the wax makes the bottle neck too wide to fit the device over it. 3. Some have reported problems using it with plastic corks, although I have never had a problem with this. 4. You have to develop a bit of a “touch” with this opener. Too much force on the top of the canister (which is the “button” you push) and too much gas goes into the bottle causing the cork to fly out of the bottle often followed by some wine. It may take a bottle or two to practice with – start with the “value” wines. Beyond that, I have nothing but good things to say about this wine opener. If you have any experiences with this one or with an opener that you like better, please comment. A 2001 RANCHO SISQUOC CABERNET SAUVIGNON. 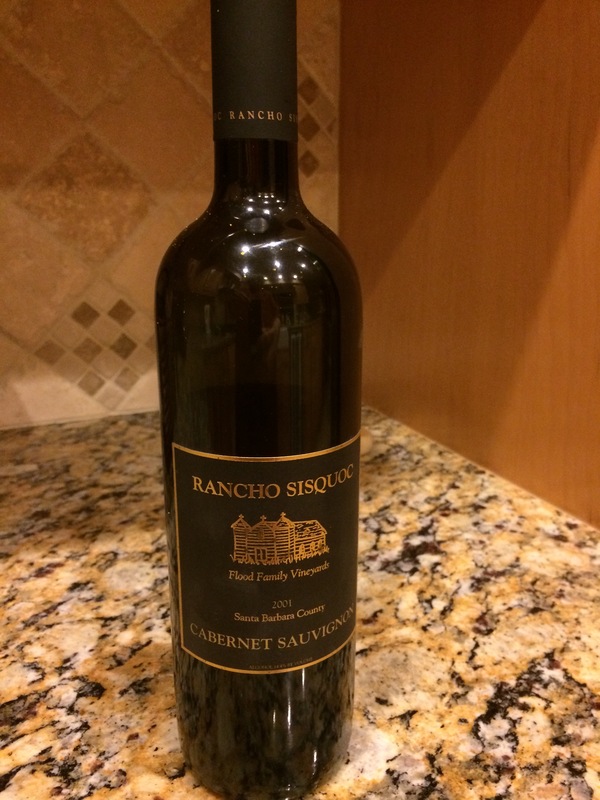 Dorianne and I opened a 2001 Rancho Sisquoc Cabernet Sauvignon(LINK) last night – a bottle that we got at the winery (LINK) in about 2006. The wine had been stored in our small wine refrigerator. We are thinning out our cellar in anticipation of moving (that will be covered in other posts) and having no fixed address for some time, so the Rancho Sisquoc was opened. The first thing I noticed was that the cork was completely dried out – the extraction process took a while and a couple of implements, and most of the cork came out in tiny pieces. This, I thought, does not bode well. I had really made a mess on the counter top – most of the cork was dust. Finally, I got to the bottom of the cork, and those pieces fell into the wine (of course). The first sniff of the bottle was promising, so I poured a bit through a screen in my Vinturi Wine Aerator (LINK), which caught most of the cork bits. Well, the wine was wonderful – rich, dark purple in color, with nice fruit (dark cherry mostly) on the nose and palate, and just a touch of minerality and leather. The wine was well-balanced and drank beautifully. There was enough integrity to that devastated cork to keep things in good shape in the bottle, for which we are very grateful. We had the wine with a snack dinner of chevre, smoked salmon, prosciutto, and crackers. Life is good! I have never had the opportunity to try the same wine with different seals. Here is an interesting article from Jamie Goode’s Wine Blog. Follow the link below. LINK: Cork or Screw Cap?